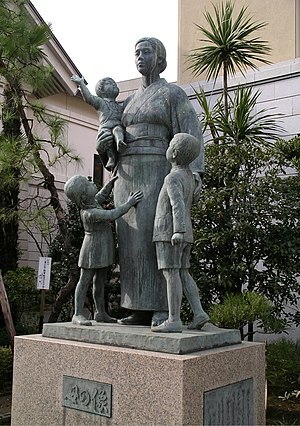 Statue of a mother at the Yasukuni shrine, dedicated to those mothers who lost their husbands in the war but suceeded in raising their children anyway. Erected in 1974. I raised six children. All that work? WHY?! It is real. Maybe that is the only reason, I don’t know, but I do know raising children is good because it is real. It is the most awesome privilege. Nothing compares to molding a human being. What could be more significant than the forming of someone, of his being? The joy of knowing they know something because I taught it to them is higher than almost any joy. I think this joy must have caused God to create people in the first place, as it is highly motivating. I was made for it. Although God has kindly given me many talents, I know they are all for my family. Spending all my time and energy on them, and investing all my talent on them is a joy. Seeing them leave the house in crisply-ironed clothing makes me smile. Watching them eat makes me smile. Increasing their benefit makes me smile. They are my opus, the thing I did on this earth to make a difference. They are full of crazy, wonderful, loving zest for life. It is a joy to say, “These people are mine,” and to know it is true in every sense of the words. It returns. I see them love their children more beautifully than I could have imagined. I see them re-discover their love for me, too, and it gives me such peace as I never knew existed. It saddens me that the world is so messed up that children could be living in horrific pain. I want all the mistreated children. I want them to be mine. I would watch them eat, teach them jokes, and then send them out in ironed clothes. It would be my joy. Posted in: Children, Mothers | Tagged: Joy, Love, My opus, Photos, Postaday, Raising children, Why bother? Alone, alone, all, all alone. Amen sister. I have nine blessings. Others think my husband and I are crazy but I know better. The fruit of the womb is God’s reward. Exactly!!! Too funny. I do not FEEL I deserve them and sometimes they don’t deserve my inconsistencies in my life. They truly made me feel unworthy this MOM’S DAY.